In the push for electricity access in the developing world, many policymakers are trying to figure out where on-grid or off-grid solutions make the most sense. My new CGD paper with colleagues Ben Leo and Jared Kalow asks 39,000 consumers in 12 African countries about their energy use and demand. 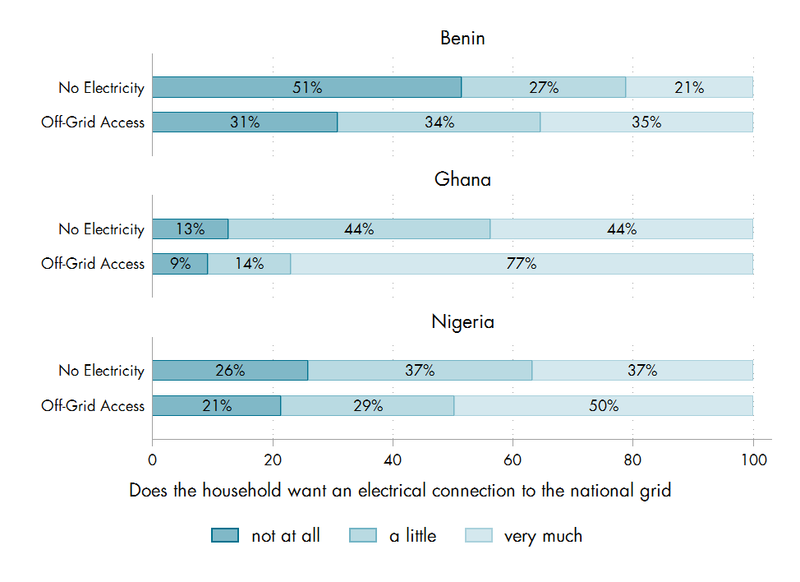 The big takeaway: African consumers don’t view grid versus off-grid as a binary question. Off-grid (non-generator) electricity is largely inadequate. A significant proportion of respondents reported that their off-grid electricity solution did not fulfill any of their power needs, including almost two-thirds of Rwandans with off-grid systems. Off-grid customers still exhibit strong demand for grid electricity. 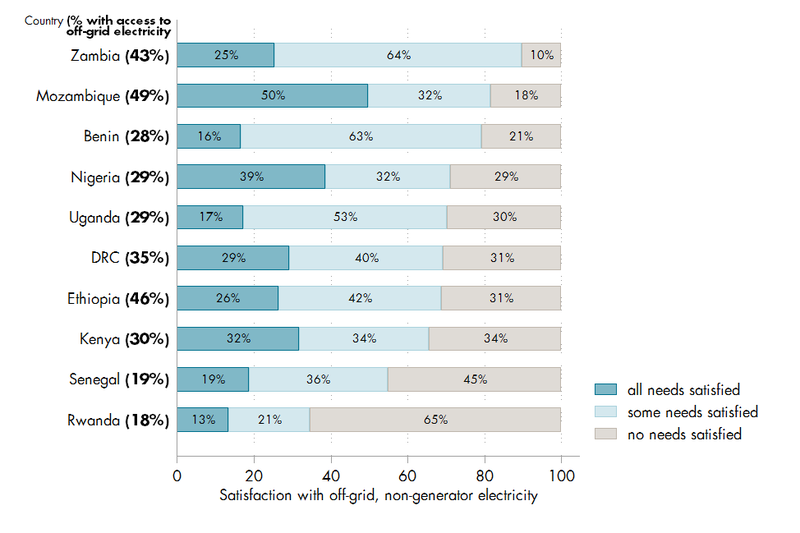 In most countries, off-grid respondents reported a high desirability for grid electricity. In fact, demand for a grid connection is significantly higher among off-grid households than those with no electricity at all. On-grid customers rely heavily on generators. 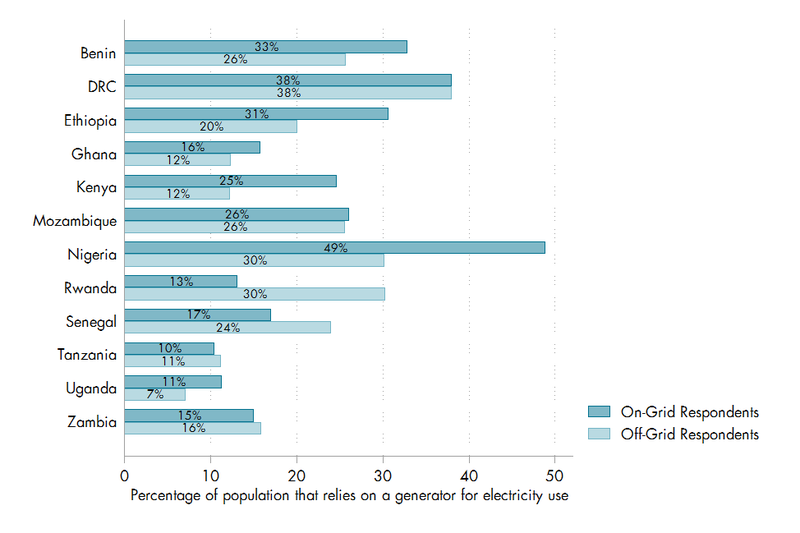 For example, nearly half of on-grid Nigerians also report generator reliance. While these findings undermine a key assumption implicit in the on-grid versus off-grid question, they make sense given energy consumption patterns. Off-grid customers may appreciate the lights and basic appliances (e.g., phone charger, fan, small TV) that off-grid systems can power, but want to move up the energy ladder toward higher power appliances (refrigerator, larger TV) enabled by a grid connection. At the same time, on-grid customers face a host of reliability issues and thus see off-grid options as an important backup. So what might this all imply for policymakers or initiatives like Power Africa? We shouldn’t assume rural means off-grid and urban means on-grid. Better information about actual consumer behavior and demand would present a more nuanced picture and a variety of solutions. Low-energy off-grid solutions should expect growing consumer demand for higher-energy systems over time. Grid reliability is a major problem.